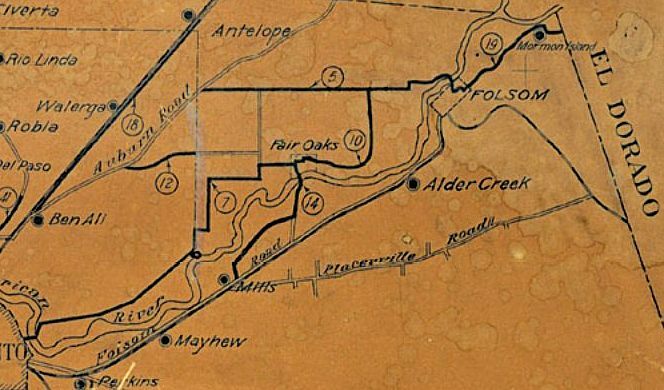 Jumping ahead to 1914, we find at the Sacramento History Online website this old map from the Sacramento County Highways Department showing road improvements planned for the County. We've cut out the portion that shows the Fair Oaks area - to see the whole map, Click here. The projects shown are: (5)Greenback Road, (7)Fair Oaks Road, (10)Winding Way, (12)Winding Way #2, and (14)Coloma Road. The #7 Fair Oaks Road project is really Winding Way from the east going to San Juan Ave, then south on San Juan to where Fair Oaks Blvd resumes and on to Manzanita. The #10 Winding Way project looks like it takes Winding Way east and loops up what is now Hazel towards Greenback.